The issue starts with Wonder Woman...of the mind! She may be taken over by the face hugger parasite that changed her last issue, but she can see clearly now. That sounds like a song...minus the face hugger bit. Anyway, the whole thing feels off from what we've had up until now and just tells us what we already knew and/or guessed. The big robot guy is the bad guy. We then get Batman trying to save Cyborg by finally getting him to the escape pods. After being told for the twentieth time why this will work. Batman may not be so sure himself as he jettisons the pod with him and Cyborg in it. Maybe that was the plan all along??? We then go to Superman and the Green Lanterns and they are still fighting...until they aren't. 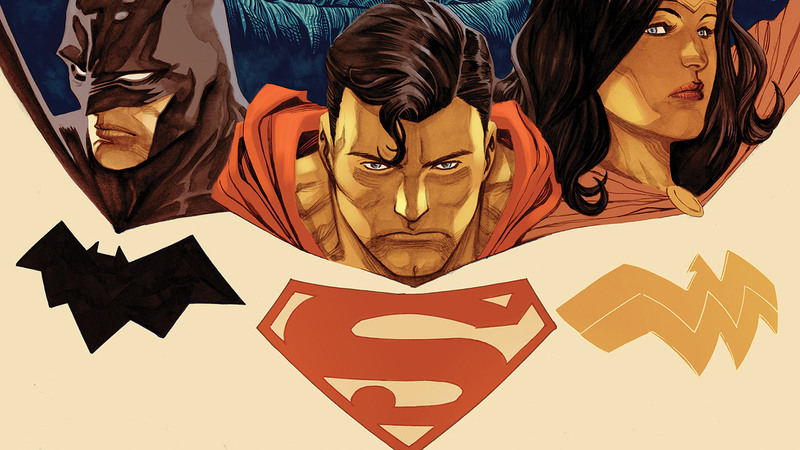 It seems at this point, Manapul has forced his message of subjugation so it makes no sense for the slaves to make the Justice League slaves themselves. 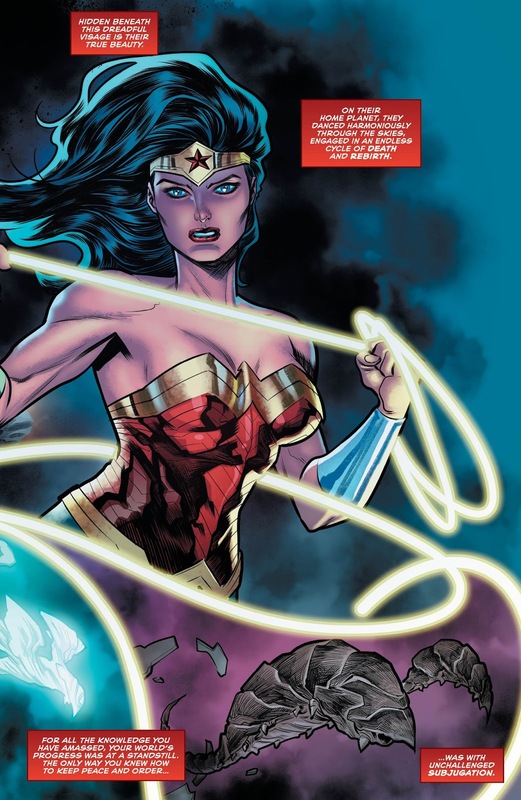 That, and the heat from reentry makes Simon and Jessica themselves again, just in time to join Wonder Woman (minus face hugger as well), Superman and Batman in an all out effort to save the Watchtower and Earth. Just an aside...how does Batman breath is Space??? 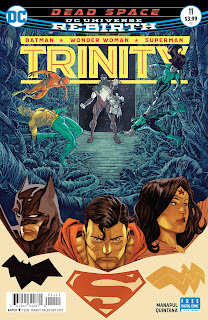 That's not the biggest problem of this issue, however, as it ends with the Green Lanterns (in) conveniently knocked out so the Trinity can save the day. I won't spoil how they did it, but trust me, it's ridiculous. But maybe not as ridiculous as the shoving aside of the Alien/Robot villain and the eco message at the end that may tie into a past story line I was hoping was gone forever. 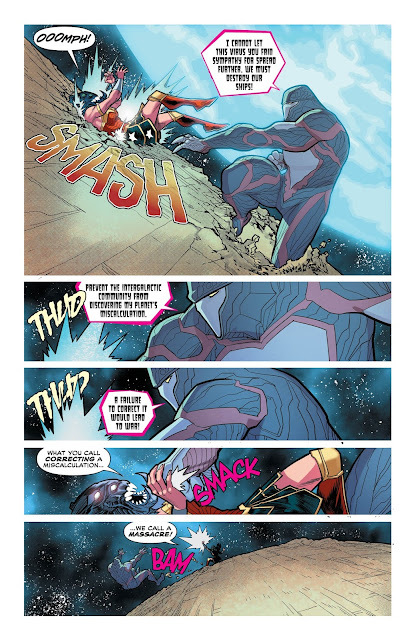 I loved the art again this month, but the story is not good at all. Things just happen because they happen and while Manapul seems to think that having the Trinity strike a heroic pose will win the day in the end, there is nothing to stand on here. The story is paper thin and pretty laughable. I was called out (rightly so) last month for letting the art sway my score a bit too much. It didn't happen this month. While the art in this issue is top notch, the story brings everything crashing down. 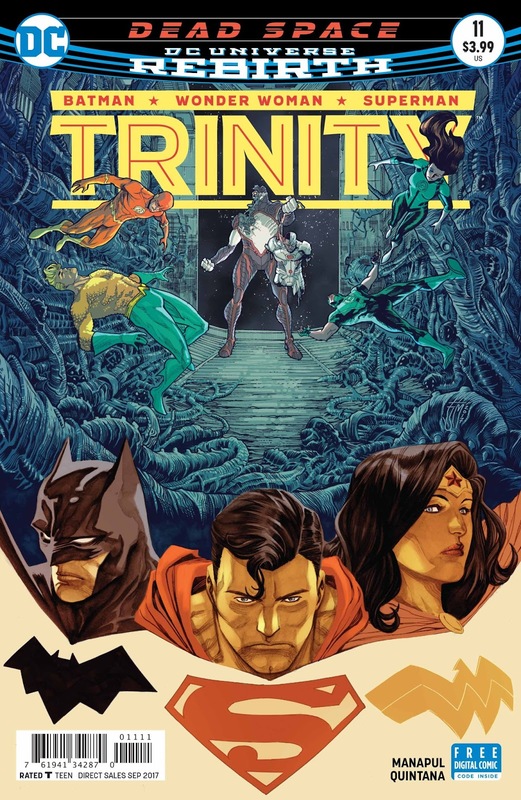 Unfortunately, the Trinity can't save the day this time. If you like looking at pretty pictures, you may get some pleasure here, but if you want characters and story in your books, look elsewhere.